Quietly positioned to the east of Askew Road near Greenside School and Cathnor Park, this Victorian house has been superbly extended and tastefully refurbished. It has a nice open conservatory kitchen - with Plain English 'British Standard' units and good quality fittings, which offers lovely family / entertaining space leading onto a secluded walled garden. The double reception room with wood burner and oak floor interconnect and allow good through light and a feeling of space. There are two bedrooms and generous bathroom on the first floor - then a spacious master suite upstairs. Westville Road runs off the southern end of Askew Road running parallel with Greenside Road and the property is just south of Greenside School. 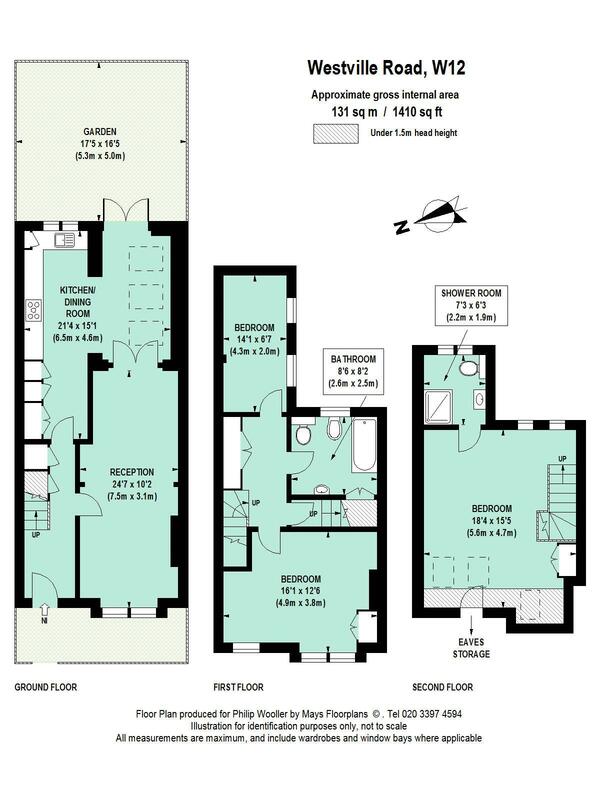 It is a short walk from both Cathnor and Ravenscourt Parks, and numerous other good schools. The wide range of independent local shops and cafes on Askew Road are close by, as are and shopping and transports hubs of Hammersmith and Westfield. 1410 sq ft / 131 sq m approx.